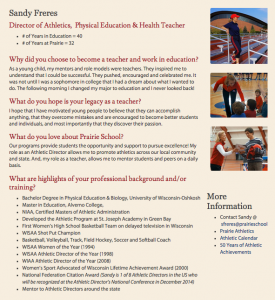 Sandy Freres has played an instrumental role in the development of Prairie’s Athletic Programs. For over 32 years, she’s served as a role model amongst our faculty and students and a leader on Prairie’s campus, the Racine community and the athletic community at both the local and state level. This coming Monday, December 15 she will be recognized by The National Federation of State High School Associations (NFHS) at the 45th annual National Athletic Directors Conference sponsored jointly by the NFHS and the National Interscholastic Athletic Administrators Association (NIAAA). She will be recognized amongst a total of eight athletic directors around that nation for her contributions to interscholastic athletics at the local, state and national levels. Please join us in congratulating Sandy on an outstanding accomplishment! This entry was posted in All News, Athletics, Featured, Fitness Center, Learn More About Prairie, Our Faculty, Primary School, Upcoming Events, Upper School by Communications Department. Bookmark the permalink.